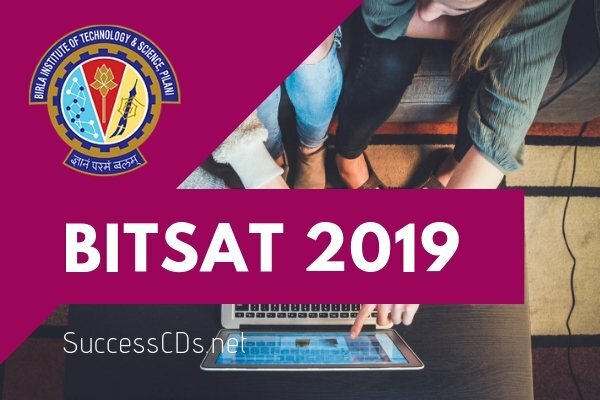 BITSAT 2019 - The Birla Institute of Technology and Science (BITS) Pilani is an all India Institution declared as Deemed to be University Admissions to all the Integrated First Degree Programs of BITS, Pilani, at Pilani Campus, Goa Campus, and Hyderabad Campus for the academic year 2019-20 will be made on the basis of a Computer based Online Test conducted by BITS, Pilani. This test will be referred to as 'BITS Admission Test - 2019', in short as BITSAT-2019. The Birla Institute of Technology and Science (BITS) Pilani, is conducting BITS Admission Test (BITSAT) - 2019 on 16th May to 26th May 2019. BITS Pilani is India’s leading institute of Higher Education and a deemed University u/s 3 of the UGC Act. With an illustrious legacy, modern campuses and alumni in leadership positions across the world, BITS Pilani has been the institute of choice for top students. B.E. : Chemical, Civil, Computer Science, Electronics & Communication, Electrical and Electronics, Electronics & Instrumentation, Mechanical. For admission to all the above Programs except B. Pharm. : Candidates should have passed the 12th Exam of 10+2 system from a recognized Central or State board or its equivalent with Physics, Chemistry, and Mathematics and adequate proficiency in English. For admission to B. Pharm. : Candidates should have passed the 12th Exam of 10+2 system from a recognized Central or State board or its equivalent with Physics, Chemistry, and Biology and adequate proficiency in English. However, candidates with PCM may also apply for Pharmacy Program. The candidate should have obtained a minimum of aggregate 75% marks in Physics, Chemistry and Mathematics subjects (if he/she has taken Mathematics in BITSAT) or a minimum of aggregate 75% marks in Physics, Chemistry and Biology subjects (if he/she has taken Biology in BITSAT) in 12th Exam, with at least 60% marks in each of the Physics, Chemistry, and Mathematics/ Biology subjects. Only Students who are appearing for 12th Exam in 2019 or who have passed 12th Exam in 2018 are eligible to appear in the BITSAT-2019 test. If a candidate has taken more than one attempt in 12th class or its equivalent, only his latest performance is considered, provided this attempt has been for the full component of subjects/courses prescribed. Students who have passed 12th Exam in 2017 or earlier are NOT eligible to appear in BITSAT-2019. Students who are presently studying in BITS at any of its campuses are not eligible to appear in BITSAT-2019. Admissions will be made purely on merit. The merit position of the candidate for admission will be based on the score obtained by the candidate in the BITSAT-2019. However, their eligibility for admission is subject to fulfilling the requirement of minimum marks in 12th Exam, as mentioned above. In the past, admission process of the Institute always ensured guaranteed admission to all the students who obtained first ranks in their respective board Exams. This has given a very vital input of highly meritorious students from all over India. 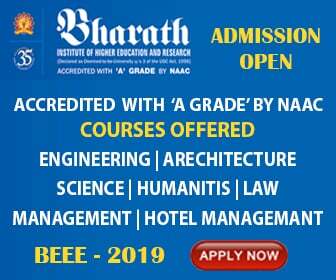 First rank students of all the central and state boards in India for the year 2019 will be given direct admission to the program of their choice, irrespective of their BITSAT-2019 score as per the eligibility criteria mentioned above. Further details about this scheme will be available at BITS admission website by 15th of May 2019. Computer Based Online test’ means the candidate sits in front of a computer and the questions are presented on the computer monitor and the candidate answers the questions on the computer through the use of keyboard or mouse. Each computer is connected to a server, which prepares the question set and delivers it to the candidate on the computer. This is unlike the traditional paper-pencil based test, which is generally offered on a single day to all candidates. BITSAT-2019 will be offered over a period of time and the candidate can choose the Center, the Day and Time of his/her convenience to take the test, as described in the later sections. The BITSAT-2019 test will be conducted on the basis of NCERT syllabus for 11th and 12th class. The detailed syllabus is given in the Annexure. Candidates may refer to the NCERT textbooks for the contents. A sample test demonstrating the features of BITSAT-2019 will be made available to the registered candidates at the BITS admission website on which he/she can practice as many times as desired. At the completion of the test, the computer will announce the result to the candidate in terms of number of total correct answers and wrong answers, with the score. The candidate can also check his or her score report at the BITS admission website on the next day of his or her test date. The candidate can also take a printout of his or her score report for any further usage. In order to facilitate a large number of students all over India to participate in BITSAT-2019, apart from Pilani, Goa and Hyderabad campuses of BITS where it is expected that a large number of students will take the test, the Institute is also planning to offer the tests at dedicated test centers in several other cities. The planned test centers are in the following cities: Agra, Ahmedabad, Allahabad, Bangalore, Bhopal, Bhubaneswar, Chandigarh, Chennai, Coimbatore, Delhi, Dubai Campus; Ghaziabad, Goa Campus, Gorakhpur, Gurgaon, Guwahati, Gwalior, Hyderabad Campus, Hyderabad City, Indore, Jaipur, Jalandhar, Jammu, Jamshedpur, Jodhpur, Kanpur, Kolkata, Lucknow, Mumbai, Nagpur, Nasik, Noida, Patna, Pilani Campus of BITS, Pune, Raipur, Rajahmundry, Ranchi, Roorkee, Siliguri, Surat, Tirupati, Thiruvananthapuram, Vadodara, Vijayawada, Visakhapatnam, Agartala, Mangalore, Udaipur, Bareilly. The candidate can choose the centers from within India or Dubai. Through BITSAT-2019: Admissions will be made purely on merit based on the score obtained by the candidate in the BITSAT-2019. Direct Admission to Board Toppers: First rank students of all the central and state boards in India for the year 2019 will be given direct admission to the program of their choice irrespective of their BITSAT-2019 score. Interested candidates should register their names for BITSAT-2019 by applying in the prescribed application form online. The password that a candidate enters (8 alphanumeric characters) during BITSAT registration process will be required for further accesses including writing the BITSAT. Hence, a candidate should keep it confidential. A candidate has to complete the application form online at http://www.bitsadmission.com and pay the prescribed fees. Also take the printout of the filled-in form for your future reference. The prescribed fee for BITSAT-2019 is Rs.3150/- (three thousand one hundred fifty) for male candidates and Rs.2650/- (two thousand six hundred fifty) for female candidates. This fee is non-refundable and non-transferrable. If a candidate chooses Dubai as a test center the application fee for both male and female candidates will be same and will be US $80 (Rs.5600). Details for payment of fees are available at the admission website while applying online. Deadline to apply for BITSAT-2019 online along with the fee payment is 5.00pm on 20th March 2019 (Wednesday). Those who register for the test and reserve test dates have to download the ‘Hall ticket’, alongwith instructions, from BITS admission website as per the schedule given earlier. The tests will be conducted during 16th May - 26th May 2019. Rs.3150/- (three thousand one hundred fifty) for male candidates. Rs.2650/- (two thousand six hundred fifty) for female candidates. Candidates should apply to the BITSAT-2019 in Online mode only. BITSAT-2019 registration link was given at the bottom of this page.